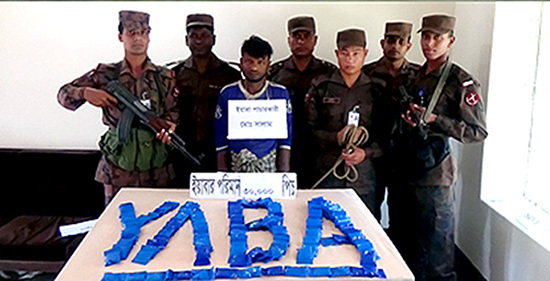 Abdu Salam (38), son of Noor Ahmed, hailed from Yay Myet Bil (Yai Twin Kyun) village of Mongdaw Township, Burma was arrested with this connection, said a close relative of the arrested smuggler who denied to be named. Being information, a BGB team halted a fishing boat in Naff River approaching to Zadi Mora area at about 5:00 am. When BGB signaled the boat to stop, soon afterwards, three men jumped into the River, but Salam was caught along with 30,000 Yaba tablets. However, the two other fled, said Major Abu Rasel Siddiqui, deputy commanding officer of BGB Battalion No.2. He was handed over to Teknaf police station later. Police filed two cases – trespassing and smuggling drugs into Bangladesh- against him, according to Teknaf police official. Besides, on 7:00 am, the same day, the BGB raided another fishing boat near Jaliardip (Island) area of Dum Dum Meah and seized over 50,000 pills from there. None was arrested from that place as they fled from boat after jumping into the River, said Maj Rasal. In addition, a Bangladeshi named Md. Seraz (30), son of Ali Ahmed, hailed from Zadi Mora under Teknaf was arrested by police with 116 Can Beer and 26 bottles of Ram whisky from Leda area, according to Teknaf police information. Though the security forces of Bangladesh have been trying to curb the smuggling of Yaba, but Yaba is flowing to Bangladesh from Burma in various ways, according to a businessman Kholil from Teknaf. This entry was posted in English, News and tagged Arakan, BGB, Burma-Bangladesh border, Naff River, Rakhine, Rohingya, Yaba. Bookmark the permalink.